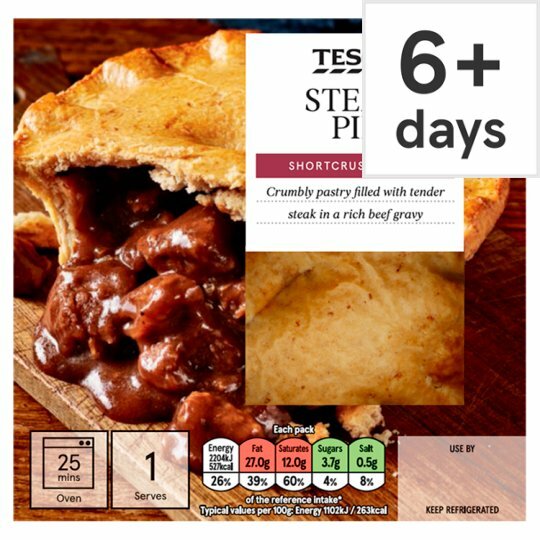 Shortcrust pastry pie filled with chunks of beef steak in gravy. Crumbly pastry filled with tender steak in a rich beef gravy. Our expert bakers make the pastry for our pies just the way you'd make it at home, giving a delicate shortcrust pastry. The fillings are cooked for tenderness and flavour. The pastry case is then deep filled, topped and milk glazed for a crisp, golden finish. Beef (40%), Wheat Flour (Wheat Flour, Calcium Carbonate, Iron, Niacin, Thiamin), Palm Oil, Water, Wholemeal Wheat Flour, Rapeseed Oil, Onion, Cornflour, Beef Stock, Black Treacle, Tomato Paste, Balsamic Vinegar, Malted Barley Extract, Dried Skimmed Milk, Malt Vinegar (Barley), Black Pepper, Thyme, Salt, Garlic Purée, Flavouring, Chilli Powder, Paprika, Garlic Powder, Clove Powder, Lemon Oil. Beef Stock contains: Beef Extract, Beef, Water, Tomato Purée, Carrot Concentrate, Salt, Leek Concentrate, Onion Concentrate, Beef Fat, Black Pepper, Laurel, Tarragon Oil, Thyme Oil, Garlic Oil. Instructions: From chilled: 200°C/Fan 180°C/Gas 6 25 mins Place on a baking tray in the centre of a pre-heated oven. Instructions: From frozen: 200°C/Fan 180°C/Gas 6 40 mins Place on a baking tray in the centre of a pre-heated oven.